The other evening I had the pleasure of attending a New York City Italian Cultural Institute event that continues the trajectory of excellence in programming offered at 686 Park Avenue even as the Italian government that supports it pursues its programmatic slide in the opposite direction. Given that Gianni Di Gregorio's multi-prize winning debut film comedy, "Mid-August Lunch" (Pranzo di Ferragosto) is a RAI Televisione product, one wonders why Berlusconi's equally comic government gets such poor reviews (See: I-Italy's "Videocracy--Berlusconi's Jersey Shore" by Maria Laurino). In any case, in the tender comedy, Gianni plays Gianni, an unemployed fifty-something bachelor caring for his 90-something mother in her saw-better-times Trastevere (Tiber) condo. With the approach of Ferragosto (Mid-August holiday), the streets are abandoned (except for the occasional lost tourist) and Gianni is roped into caring for the elderly mother and aunt of the condo’s accountant, in lieu of paying outstanding charges. The accountant claims he wants a day or two to see his wife and children in the countryside, but Gianni, from his front terrace window watches as he jumps into a sports car with a twenty-something blond. It was a superb filmic experience (subtitling greatly appreciated (sottotitoli notevolmente apprezzati). Even more greatly appreciated was the post- showing appearance of one of my favorite Italian Americans --- Lidia Bastianich. Her television show Lidia’s Italy, that I often watch on Public Television WLIW Channel 21 is much more than a cooking program; it celebrates the spiritual dimensions of eating as it binds people together with history and culture; remember that only foodaholics eat alone. Not only have I learned to concoct things virtually in her kitchen, like recently a rolled stuffed breast of veal that I will never actually make, I have come to know Lidia’s daughter, son, mother, and grandchildren, whom I will never actually meet. Which brings me to the blurry photographs interspersed in this pseudo movie and television review. They are of 60% of my grandchildren; two Delgados and one Cahill, who often come to my house like a whirlwind to make a mess in and out of the kitchen/dining room. 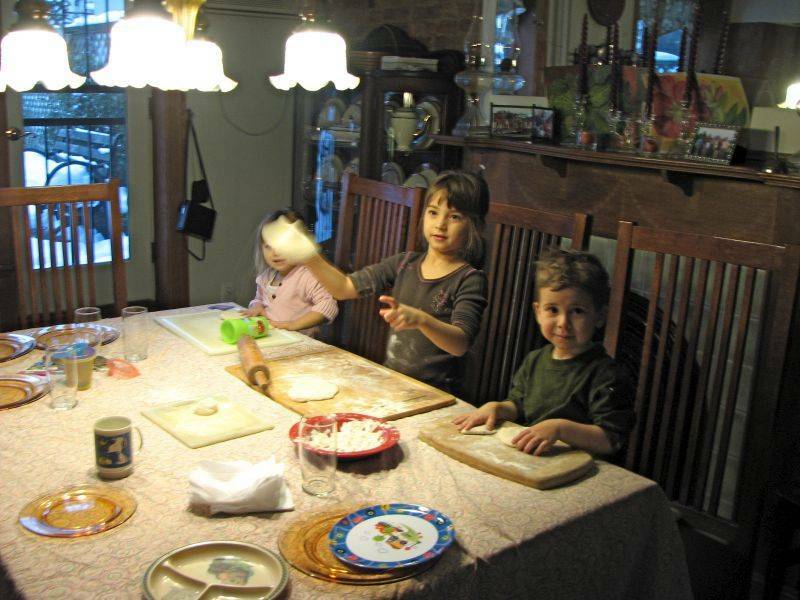 In this case they are engaged in the process of making individual pizzas (creazioni degli pizzaioli straordinari) for themselves. I must confess that, although I can, I don’t make the dough that they roll and toss. But they do vigorously (de)form their own pies and gleefully apply all the ingredients, which almost always actually fall on, or at least near, the dough, and often, although less frequently, get eaten by them at the chaotic dinner table (tavola di pranzo italiano). The point of all this, I guess, is that for Gianni, Lidia, and I preparing food for the people we love often tastes better than the meal itself. There must be a cooking lesson here for Silvio & Company somewhere. Then again, perhaps not (Allora ancora, forse non.). Tutti a tavola per democrazia?